It has been a few months since I last wrote a blog post. It seemed like I ran out of material to write about. As you know, the purpose of these posts is to share only information 1) that is based on research and is not a merely hearsay, 2) that I have personal experience with, and 3) that I feel contribute towards a goal of living the longest with optimal health. For a while I had plenty of such information that fit the scope of this blog. And, then I hit the wall. About a year and a half ago, I found a source that has troves of nutritional information for optimal health. This information is available in videos and text form – all for FREE. Using this information, I have been further optimizing my own lifestyle. And, it has already showing further improvements in my bio-markers. This site is a labor of love for Michael Greger M.D. FACLM. He seems to be on a personal crusade to share this knowledge and information. He and his staff of volunteers comb through over 20,000 research papers on nutritional studies published every year. They summarize this information in few minutes long byte-sized chunks and even as annual summaries, which last about an hour. You can even subscribe to their site and you will receive a tip every day in your email. I actually look forward to these emails. That way I can learn over time and don’t take in more than I can digest. I got introduced to Dr. Greger’s work by reading his book: How Not to Die. How you can reverse your diabetes by changing what you eat. How you can shrink you prostrates by adding certain fruits to your diet. How you can reduce blood pressure with certain plant based foods. And, for every claim, he gives his rationale based on specific research studies and papers that you can further read up yourself, if you wish. I am now working on replacing, whenever possible, to get as many micro-nutrients as possible using whole foods rather than supplements. I started adding one tablespoon of freshly ground Flax Seeds and a quarter teaspoon of Turmeric in my shakes every morning. As you will see from the research, flax seeds and turmeric are effective for a whole bunch of issues, e.g., blood pressure, diabetes, inflammation. I started adding one table spoon of Apple Cider Vinegar in my salads at lunch to lower my blood sugar resulting from food at lunch, which tends to be my heaviest meal. I have been eating 2 to 4 pieces of Brazil Nuts as snack every night to further lower my LDL Cholesterol. I am now more conscious of making sure that I add Cruciferous Vegetables in my salads to boost my anti-oxidants. I have started sprinkling pomegranates seeds on my oat meal for my prostrate health. My most recent blood-work on 7/7/2017 shows, an Hemoglobin A1C of 5.4%! It was 5.5% three months ago. My A1C was stuck at or above 5.8% for the last three years, ever since I have been measuring it. Ever since then, I have been working on getting it out of the pre-diabetes range, considered to be over 5.6%. All my inflammation markers, CRP, Homocysteine, WBC are all trending down. 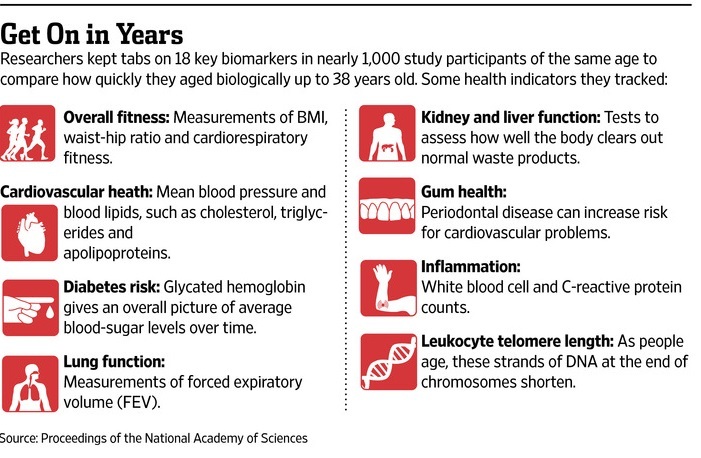 LDL and Triglycerides are 86 and 57 in the latest blood-work – without any meds. These are on the low end of where they ever been. My blood pressure measured on my last doctor’s visit was 108/70! As I have mentioned in previous posts, I have working on reducing my BP. I highly recommend that you checkout www.NutrtionFacts.org. An evidence-based nutrition advice that is labor of love of Dr. Michael Greger. You can search for a specific topic, browse the site in general for useful information and/or subscribe to the daily email. This site has become a go-to site for me for all things nutritional for Optimal Health. I have found the information is research-based, concise, well-presented and at-times with profound implications. Most of the time, information is very actionable. In Post #51, I discussed some basic terminology of the immune systems, how immune system works, and what kinds of issues happen when it does not work. In this post the focus is what we can do to keep our immune system healthy and working as designed. So, what can we do to optimize our immune system? Things that are in our control to enhance our immunity and make sure that the immune system does not go haywire are the ones that you have heard about gazillions of time by now and are probably tired of hearing about: Nutrition, Exercise and Lifestyle. Each one is a topic in itself. In this post, let’s tackle nutrition. As Prof. Chris D’Adamo, Director of Research at Center of Integrative Medicine at University of Maryland School of Medicine, recently gave a talk summarizing research on different foods are known to have immunity enhancing properties. Lot of the content that follows is from his talk. Mushrooms – Over 5,000 different types of mushrooms exist in nature many of which are used in traditional medical systems. In Shitake mushrooms Polysaccharides alpha-Glucans enhance immune system by enhancing the macrophage activity. Shitake mushrooms have been shown in research to have antibacterial, anti-fungal, anti-viral effects. They have also been shown to offer defense against influenza virus and useful in cancer therapy. Maitake mushrooms enhance immune activity. While White Button mushrooms have been shown to regulate immune activity, both up and down as needed and useful against breast and prostate cancers. So, eating a variety of mushrooms can enhance and regulate the immune system. Cooking mushrooms is better since many contain hyrozines, a carcinogen that is deactivated by heat. As a practical tip, just wipe mushrooms clean and not wash in water since mushrooms are porous and soaking may make them soggy. Allium Vegetables – Garlic, Onions, scallions, shallots, chives, leeks,etc. The Allium genus includes approximately 500 species that include garlic, onion, leeks, chives, scallions which are used all over the world in different delicacies. Some allium vegetables have been employed for millenia in the traditional medical practice to treat cardiovascular diseases. These vegetables have been shown to have applications as antimicrobial, antithrombotic, antitumor, hypolipidaemic, antiarthritic and hypoglycemic agents. In recent years, extensive research has focused on the anticarcinogenic potential of allium vegetables and their constituents, viz., allylsulfides and flavonoids (particularly quercetin which is present abundantly in onion). Epidemiological studies have shown that higher intake of allium products is associated with reduced risk of several types of cancers. These epidemiological findings are well correlated with laboratory investigations. Organosulfur compounds present in Allium vegetables, are considered to be responsible for the beneficial effects of these herbs. To maximize health benefits of garlic crushing or chopping garlic bulb is important since it converts sulfur compound alliin to more bioactive allicin. It is also important to leave crushed/chopped garlic for serveral minutes before cooking for enhanced activity of allinase enzymes. And, to maximize health benefits of onions, don’t overpeel. Flavonoid content is highest in the outermost layers. Bacteria in the gut, aka Gut Biota, continues to be one of the most exciting topic in health and wellness research. Gut biota and therefore probiotics play a huge role in immunity. Some believe as much as 50% of the immunity is in the gut. Probiotics are defined as any live microorganisms that confer health benefits. Kimchi – fermetend cabbage, radhishes, etc. If not chosen carefully, any of these foods can be used in a way that turns them into junk food. For example, in the US, we have taken healthful yogurt and turned it into a junk food by adding sugar and other additives. To figure out what yogurt to buy, check out website http://cornucopia.org/yogurt-scorecard/. Out of 130 yogurts, the site lists Activa, Yoplait and Dannon as numbers 124, 126, and 129. Zinc is essential to immune function. There is over 30 years of research that shows that Zinc reduces duration, severity and incidence of common cold. You do need to take zinc within 24 hours of symptom onset for best effect. Vitamin C is also essential for immune function. Research has shown that vitamin c prevents common cold and reduces duration of cold symptoms among people who exercise regularly. Elderberry is a dark-colored berry high in anthcyannis. It is shown to relieve flu symptoms and inhibit bronchitis virus replication. Oregano oil has very strong antimicrobial properties. It has very strong taste and can burn in contact with skin. So, it is taken in capsules or a few drops in water. Also, being antimicrobial it is not useful to take it at the same time you are taking probiotic or eating fermented foods. He is a pretty big guy. So smaller people might need less, bigger people may need more or bigger doses. It is useful to have a personal plan and kit ready for attacking common colds and flu by boosting your immune system, as soon as you see it coming. Research shows that you can prevent and reduce severity and/or duration. Zinc, Vitamin C, elderberry extract, probiotics, mushroom extract, oregano oil and plenty of water are past folklore and are now part of evidence-based medicine. The term immune system is talked about a lot these days in various contexts. On one end of the spectrum people talk about “building” one’s immune system to ward off or overcome diseases. On the other hand, you may have heard conversation about where the disease itself is the result of some “immune disorder”. Later after doing my own research, I figured out that actually we do know a lot about the immune system and there is a lot we can do about it too. And, that knowledge gave me the impetus to take actions to cure my seasonal allergies. See my post So, did I tell you the story about my allergies? In this post, I would like to delve into what exactly is immune system and what we can do so it is really a friend and not our foe. Here is a quick summary of some key terms from National Institute of Allergy and Infectious Diseases (NIAID) at NIH website. The immune system is a network of cells, tissues, and organs that work together to protect the body from infection. The overall function of the immune system is to prevent or limit infection. Skin: The skin is usually the first line of defense against microbes. Skin cells produce and secrete important antimicrobial proteins, and immune cells can be found in specific layers of skin. Bone marrow: The bone marrow contains stems cells that can develop into a variety of cell types. The stem cells in the bone marrow create two types of immune cells: innate immune cells and adaptive immune cells. Innate immune cells —neutrophils, eosinophils, basophils, mast cells, monocytes, dendritic cells, and macrophages— are important first-line responders to infection. Adaptive immune cells—B cells and T cells—that are responsible for mounting responses to specific microbes based on previous encounters since they retain immunological memory. Natural killer (NK) cells share features of both innate and adaptive immune cells, as they provide immediate defenses like innate cells but also may be retained as memory cells like adaptive cells. Lymphocytes – B, T, and NK cells also are called lymphocytes. Bloodstream: Immune cells constantly circulate throughout the bloodstream, patrolling for problems. When blood tests are used to monitor white blood cells, another term for immune cells, a snapshot of the immune system is taken. If a cell type is either scarce or overabundant in the bloodstream, this may reflect a problem. Thymus: T cells mature in the thymus, a small organ located in the upper chest. Lymphatic system: The lymphatic system is a network of vessels and tissues composed of lymph, an extracellular fluid, and lymphoid organs, such as lymph nodes. The lymphatic system is a conduit for travel and communication between tissues and the bloodstream. Immune cells are carried through the lymphatic system and converge in lymph nodes, which are found throughout the body. Lymph nodes are a communication hub where immune cells sample information brought in from the body. For instance, if adaptive immune cells in the lymph node recognize pieces of a microbe brought in from a distant area, they will activate, replicate, and leave the lymph node to circulate and address the pathogen. Thus, doctors may check patients for swollen lymph nodes, which may indicate an active immune response. Spleen: The spleen is an organ located behind the stomach. Spleen is important for processing information from the bloodstream. Immune cells are enriched in specific areas of the spleen, and upon recognizing blood-borne pathogens, they will activate and respond accordingly. Mucosal tissue: Mucosal surfaces are prime entry points for pathogens, and specialized immune hubs are strategically located in mucosal tissues like the respiratory tract and gut. How does immune systems defenses work? An immune response is generally divided into innate and adaptive immunity. Innate immunity occurs immediately, when circulating innate cells recognize a problem by expressing genetically coded receptors. Collectively, these receptors can broadly recognize viruses, bacteria, fungi, and even non-infectious problems. However, they cannot distinguish between specific strains of bacteria or viruses. Their key feature is quick and broad. Adaptive immunity occurs later, as it relies on the coordination and expansion of specific adaptive immune cells. If a B or T cell has a receptor that recognizes an antigen from a pathogen and also receives cues from innate cells that something is wrong, the B or T cell will activate, divide, and disperse to address the problem. B cells make antibodies, which neutralize pathogens, rendering them harmless. T cells carry out multiple functions, including killing infected cells and activating or recruiting other immune cells. Vaccination, or immunization, is a way to train your immune system against a specific pathogen. Vaccination achieves immune memory without an actual infection, so the body is prepared when the virus or bacterium enters. Saving time is important to prevent a pathogen from establishing itself and infecting more cells in the body. When immune system is not working as intended? When the immune system is working well through all the parts and pieces we discussed above, it is a thing of beauty. As a pathogen enters the body, body’s defenses are activated through the appropriate part of the immune system. The pathogen is recognized and immediately zapped. When immune system is not working properly there could be different types of issues. Temporary Immune Deficiencies: Temporary immune deficiency can be caused by a variety of sources that weaken the immune system. Common infections, including influenza and mononucleosis, can suppress the immune system. When immune cells are the target of infection, severe immune suppression can occur. For example, HIV specifically infects T cells, and their elimination allows for secondary infections by other pathogens. Patients receiving chemotherapy, bone marrow transplants, or immunosuppressive drugs experience weakened immune systems until immune cell levels are restored. Pregnancy also suppresses the maternal immune system, increasing susceptibility to infections by common microbes. Allergies are a form of hypersensitivity reaction, typically in response to harmless environmental allergens like pollen or food. Hypersensitivity reactions can be caused by antibodies, IgE or IgG, which are produced by B cells in response to an allergen. Overproduction of these antibodies activates immune cells like basophils and mast cells, which respond by releasing inflammatory chemicals like histamine. And that is why people take antihistamine to stop allergic reactions such as sneezing. Allergic reactions can also be caused by T cells, which may either directly cause damage themselves or activate macrophages and eosinophils that damage host cells. Autoimmune diseases occur when adaptive immune cells that recognize host cells persist unchecked. Autoimmunity is either organ-specific or systemic, meaning it affects the whole body. Autoimmune diseases have a strong genetic component, and with advances in gene sequencing tools, researchers have a better understanding of what may contribute to specific diseases. Some forms of cancer are directly caused by the uncontrolled growth of immune cells. Leukemia is cancer caused by white blood cells. Lymphoma is cancer caused by lymphocytes, i.e., adaptive B or T cells. Myeloma is cancer caused by plasma cells, i.e., mature B cells. Unrestricted growth of any of these cell types causes cancer. In addition, an emerging concept is that cancer progression may partially result from the ability of cancer cells to avoid immune detection. So, what can we do optimize our immune system? Things that are in our controls to enhance our immunity and make sure that the immune system does not go haywire are the ones that you have heard about gazillions of time by now and are probably tired of hearing about: Nutrition, Exercise and Lifestyle. In the next post, we will talk of specifics of nutrition, exercise and lifestyle that can enhance immune system and also prevent it from attacking itself or the body. In the meantime, what are your thoughts on this subject? Post #48 – Is cancer preventable through optimal healthy living? My wife Kimberly was telling me the other day that 2015 has been quite a remarkable year in that we had several cancer episodes among our friends and families. Even a couple of them died. So, that got me thinking… is cancer preventable through optimal healthy living? According National Institute of Health (NIH), National Cancer Institute (NCI) website www.cancer.gov, cancer is the name given to a collection of related diseases. In all types of cancer, some of the body’s cells begin to divide without stopping and spread into surrounding tissues. Cancer can start almost anywhere in the human body, which is made up of trillions of cells. Normally, human cells grow and divide to form new cells as the body needs them. When cells grow old or become damaged, they die, and new cells take their place. When cancer develops, however, this orderly process breaks down. As cells become more and more abnormal, old or damaged cells survive when they should die, and new cells form when they are not needed. These extra cells can divide without stopping and may form growths called tumors. Many cancers form solid tumors, which are masses of tissue. Cancers of the blood, such as leukemias, generally do not form solid tumors. Cancerous tumors are malignant, which means they can spread into, or invade, nearby tissues. In addition, as these tumors grow, some cancer cells can break off and travel to distant places in the body through the blood or the lymph system and form new tumors far from the original tumor. A cancer that has spread from the place where it first started to another place in the body is called metastatic cancer. Under a microscope, metastatic cancer cells generally look the same as cells of the original cancer. Cancer is a genetic disease—that is, it is caused by changes to genes that control the way our cells function, especially how they grow and divide. Three main types of genes may be involved—proto-oncogenes or genes involved in normal cell growth, tumor suppressor genes, and DNA repair genes. These changes are sometimes called “drivers” of cancer. Inherited genetic mutations play a major role in about 5 to 10 percent of all cancers. Researchers have associated mutations in specific genes with more than 50 hereditary cancer syndromes, which are disorders that may predispose individuals to developing certain cancers. Avoid or control things known to cause cancer. Let us take these items one at a time. Diet is anything we put in our mouths on a regular basis. Diet is always a controversial subject. Media loves to talk about any new tidbit that comes out through research regarding diet. Some studies show that fruits and non-starchy vegetables may protect against cancers of the mouth, esophagus, and stomach. Fruits may also protect against lung cancer. Avoid alcohol or drink no more than 1 drink per day for women or 2 per day for men. T. Colin Campbell, PhD distills his 30 years of research on cancer and diet in “The China Study”. He concludes that a vegan diet minimizes the risk of all types of cancers as well as many other types of health risks. Adults: Get at least 150 minutes of moderate intensity or 75 minutes of vigorous intensity activity each week (or a combination of these), preferably spread throughout the week. Children and teens: Get at least 1 hour of moderate or vigorous intensity activity each day, with vigorous activity on at least 3 days each week. Limit sedentary behavior such as sitting, lying down, watching TV, and other forms of screen-based entertainment. Doing some physical activity above usual activities, no matter what one’s level of activity, can have many health benefits. Finding cancer or precancerous conditions early. Precancerous conditions are conditions that may become cancer. Cancer is a group of diseases that can cause almost any sign or symptom. The signs and symptoms will depend on where the cancer is, how big it is, and how much it affects the organs or tissues. If a cancer has spread (metastasized), signs or symptoms may appear in different parts of the body. Treatments work best when cancer is found early – while it’s still small and is less likely to have spread to other parts of the body. This often means a better chance for a cure, especially if the cancer can be removed with surgery. A good example of the importance of finding cancer early is melanoma skin cancer. It can be easy to remove if it has not grown deep into the skin. The 5-year survival rate (percentage of people who live at least 5 years after diagnosis) at this early stage is around 98%. Once melanoma has spread to other parts of the body, the 5-year survival rate drops to about 16%. Some symptoms, such as tiredness or coughing, are more likely caused by something other than cancer. Symptoms can seem unimportant, especially if there’s a clear cause or the problem only lasts a short time. In the same way, a person may reason that a symptom like a breast lump is probably a cyst that will go away by itself. But no symptom should be ignored or overlooked, especially if it has lasted a long time or is getting worse. Most likely, symptoms are not caused by cancer, but it’s important to have them checked out, just in case. If cancer is not the cause, a doctor can help figure out what the cause is and treat it, if needed. These days it is not that difficult to get one’s genome mapped and find out any cancer syndromes that might be present and actively take the necessary preventative actions. The American Cancer Society recommends these cancer screening guidelines for early detection of cancer for most adults. Screening tests are used to find cancer before a person has any symptoms. Some chemoprevention studies have shown good results. For example, selective estrogen receptor modulators (SERMS) such as tamoxifen or raloxifene have been shown to reduce the risk of breast cancer in women at high risk. Finasteride and dutasteride have been shown to reduce the risk of prostate cancer. Cancer is a genetic disease that may be the result of either mutated inherited genes or the ones occur later due to health, lifestyle and environment issues. Only about 5 to 10% of the risk of cancer is due to mutated inherited genes. In case of any signs or symptoms, get a quick check up to rule out any cancerous or precancerous condition. Your thoughts on this subject? Would love to hear, learn and share information. If possible, please do leave comment in the blog itself, so others can share and learn. Post #42 – Which sweeteners are best to use for optimal health? 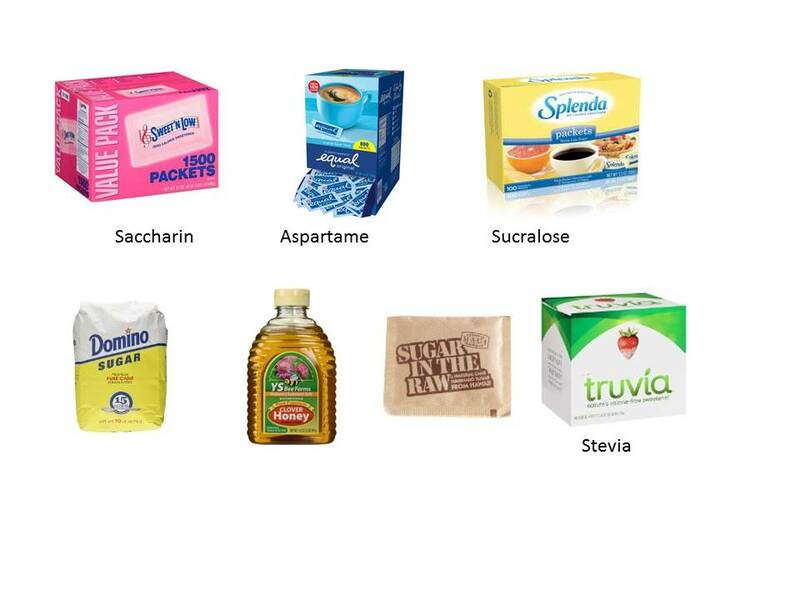 Every day, we are all faced with choices of how much sweeteners to use and which ones? Every time, we drink a cup of coffee or tea, we have many choices of which sweetener to use. And, of course every time, we select any product and read the list of ingredients there are even more variations of sweeteners. Whether it is cookies, sodas, jams, jellies, fruit yogurts, juices, chewing gum, toothpaste, pickles, Kool Aid, frozen dinners, breath mints, iced tea, or any of the other thousands of products on the super market shelves, many have one or more sweeteners. Sugar alcohols: Maltitol, erythritol,xylitol, sorbitol, mannitol, isomalt etc. So, which ones are desirable, okay, bad or ugly? I recently attended a seminar on sweeteners at University of Maryland Medical Center Institute of Integrative Medicine given by a faculty member, Chris D’Adamo, Ph. D. and a Nutrition Coach at their clinic Rachel Druckenmiller. They offered lots of great information. In fact, if you are interested, I will be happy to send you a copy of their presentation. Here is some key information I learned. First a quick math that may be useful in reading the food labels and keeping track of your carbohydrate consumption: 4 grams of sugar = 1 Teaspoon = 1 sugar cube. 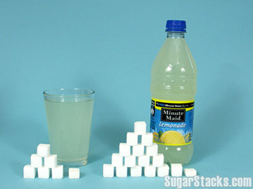 It is very important to understand how much sugar you may be ingesting in a serving. Since, most of us understand teaspoons, this conversion can help visualizing. 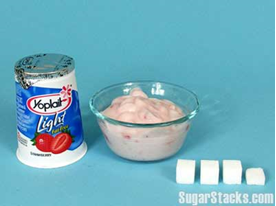 For example, 10 teaspoons in can of coke, 17 teaspoons in a bottle of lemonade and 7 teaspoon in one serving of Yoplait yogurt as pictured below. 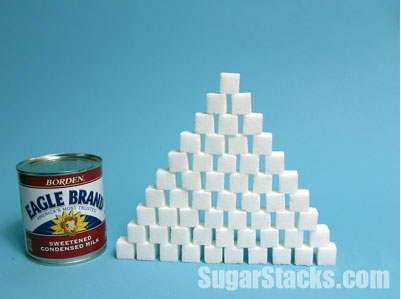 A 14oz can of condensed milk has 55 teaspoons of sugar. How can they even do that! www.SugarsStacks.com has many more such examples. Glycemic Index and Glycemic Load are two related terms used to measure of how quickly a specified amount of food will cause a rise in blood sugar level. Glucose has a glycemic index (GI) of 100 and fructose is 25. Sucrose (Ordinary sugar) which is made up of a combination of these two has a GI of 65. This website http://www.sugar-and-sweetener-guide.com/glycemic-index-for-sweeteners.html gives Glycemic index of all different sweeteners. Glycemic Load (GL) also accounts for the total amount of carbohydrate content, not just how fast it converts to glucose. 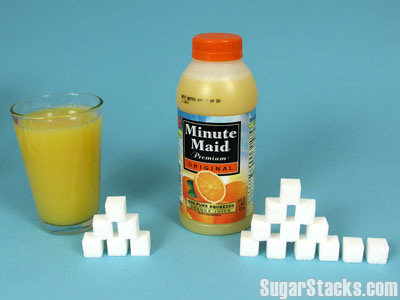 So, it would seem that we should pick the sweetener with the lowest Glycemic Load. But alas, the life is not that simple! Artificial Sweeteners have GI of zero and often very small GL, but they have other harmful effects on the body. These are well documented in research, although FDA has these on it Generally Regarded As Safe (GRAS) list. Aspartame is known to induce DNA damage, causes oxidative stress in brain, has neurotoxic & carcinogenic metabolites, i.e., causes brain damage and cancer. Also, is known to cause depression, insomnia, seizures, memory loss, triggers headaches. It can also cause heart arrhythmias and hypertension. It is also associated with weight gain and damages gut bacteria. Just last week Pepsi announced that they will be discontinuing the use of Aspartame. Sucralose – currently there are not enough human studies and no long term human studies. It has been observed to elevate blood glucose and insulin in some research studies, known to damage gut bacteria, has been involved in inflammatory bowel disease, may trigger migraine headaches. Coke has been introducing beverages with Sucralose. Acesulfame K – negatively impacts thyroid, has produced thyroid tumor in rats, rabbits and dogs, and may have negative effect on neurometabolic function. I think you get the idea! All artificial sweeteners have their down side. Saccharin and Aspartame are the worst. High Fructose Corn Syrup or HFCS is everywhere in products. It is often the cheapest source of sweetening a product. But it has many adverse health effects. 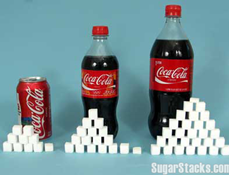 HFCS digested, absorbed and metabolized differently than glucose. HFCS is metabolized in liver and favor creation of fat. It also increases triglycerides and VLDL. HFCS increase risk factors for cardio vascular diseases. It is definitely advised to avoid High Fructose Corn Syrup. Avoid regular intake of artificial sweeteners. Infrequent intake is unlikely to do harm. However, there is enough evidence to suggest caution for regular use. Make moderate use of natural sweeteners – Stevia, honey, molasses, maple syrup, coconut sugar, yacon, dates are the choices – within your personal dietary carbohydrate goals. Do a gradual “sweetener taper”. Taste buds will adapt. Eat moderate amount of whole fruits (preferably ones with low fructose) and berries for sweet taste and health benefits. What is your take on the sweetener?